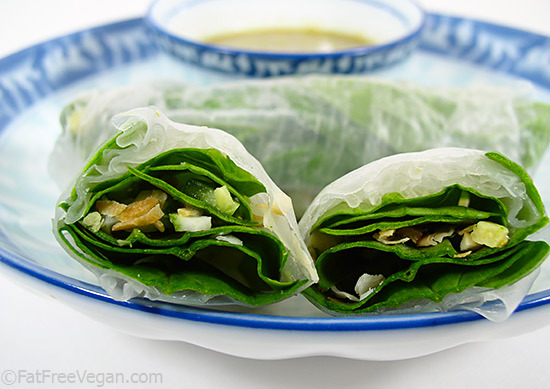 What do you get when you combine a Thai snack food with a Vietnamese spring roll wrapper: Miang Kum Rolls, of course! Here’s the back-story: I was thinking of making up a batch of Spring Rolls, to go with the Korean Stew I was planning for dinner last night. And I also had a craving for Miang Kum, the Thai appetizer that consists of spinach or lettuce leaves (or betel leaves, in Thailand) wrapped around spicy and sweet goodies, such as chopped ginger, chili peppers, and toasted coconut. Then it hit me: I could put all those ingredients, along with the spinach, into a rice paper wrapper! It’d be much easier to eat, and they could all be prepared ahead of time, instead of each diner preparing his or her own. Of course, this way the work is all on the cook, so you may want to skip my wrapping idea and do it the traditional way. If that’s the case, just prepare the filling ingredients and the sauce, set them out with some medium-large spinach leaves, and instruct your guests to place bites of the fillings on the leaves, drizzle them with sauce, pinch closed, and eat. Either way, it’s delicious! And here’s a Must-Try Alert: this sweet-and-gingery, practically raw sauce is INCREDIBLE! 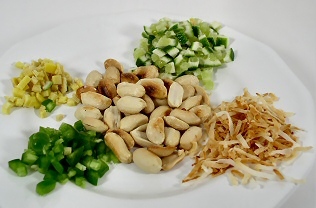 Even if you don’t make the Miang Kum, make the sauce, even if all you have to dip in it is your fingers. I plan to make it my new salad dressing. Before you begin: Dry toast 1/2 cup of unsweetened shredded dried coconut in a skillet over medium-high heat. Cook and stir constantly until it is mostly browned, and remove it to a plate to cool. You’ll use half of it in the sauce, and half as one of the fillings. Blend all sauce ingredients in a blender until smooth and set aside. Have your filling ingredients assembled before you start making the rolls. Prepare a pot of warm water large enough to hold the spring roll wrappers. Place 2 wrappers into the water. Wait a minute or two until they are soft, and then remove them to a clean towel, being careful not to tear the wrapper. Place one wrapper on a plate or other work surface. Place a layer of spinach leaves in a horizontal line just below the center of the wrapper; top them with the fillings of your choice, and then cover the fillings with another layer of spinach leaves. Fold the bottom of the wrapper up over the filling, then fold each side toward the center. Roll from the bottom to the top of each roll, as tightly as you can without ripping the wrapper. If you do rip it, just keep rolling: small rips shouldn’t affect the finished roll. Start soaking two more wrappers as you begin work on the second roll. Repeat until completed, covering the finished rolls with a moist towel to prevent drying out. Serve at once with the dipping sauce. As I said, the dipping sauce is not to be missed. It is based on a recipe in Nancie McDermott’s Real Vegetarian Thai, though her recipe cooks the sauce and uses twice as much sugar. I may try it that way some day, but for now, this is my new found favorite dipping sauce. Kid-Friendly Tip: E. loved these, but I had to leave out all of the “spicy” fillings; what was left was spinach leaves, peanuts, and coconut. But at least she was eating raw spinach! Would this be your new ingredient for an old recipe challenge? Hi – I think I found it too and I am going to take your advice in this article and at least make the sauce to use as a salad dressing. I love your blog! In fact, I just made your carrot spice muffins this morning for company and they were enjoyed by all. hey this looks like it might be it and it looks delicious! My guess for Old Recipe Challenge. I absolutely love your website! I have made several of the recipes and have loved every one! Keep it up, and when 🙂 you make a cookbook, I’ll be the first in line to buy one. I made these and I immensly enjoyed the fresh lime in them. 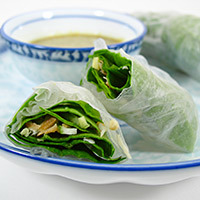 I typically make spring rolls with a bed of cilantro so it was very refreshing to have new flavors in a fun roll up food to eat. Thank you. I’m not all that experience as a cook, so I’ve never head of leaving the peel on limes like this. Just wanted to double-check that this is accurate. Sounds great and I can’t wait to try time. Yes, this is how it’s served, but it is very sour, so you can skip the limes if you want.